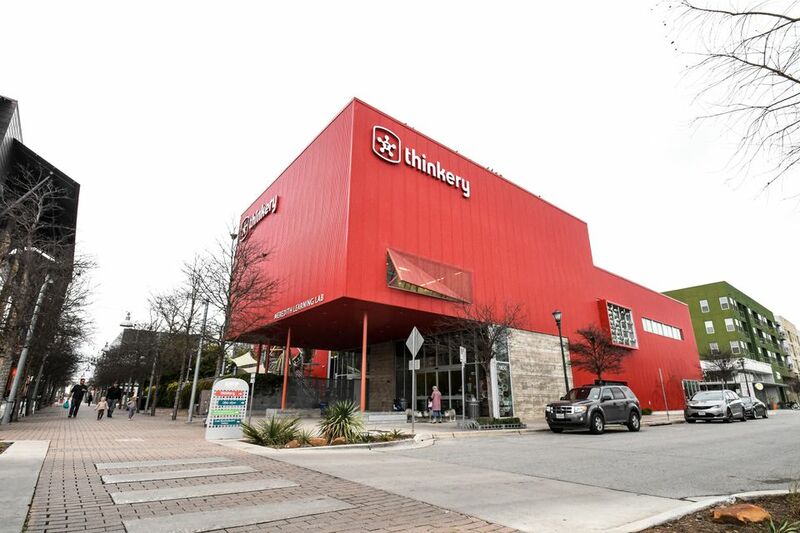 Designed to help kids develop creativity and critical thinking skills, the exhibits at The Thinkery are also just plain fun. Parents will appreciate the museum’s guides who help lead the little ones through many of the exhibits. With 40,000 square feet of exhibit space, the museum can be a little overwhelming without the help of a knowledgeable guide. The Spark Shop houses a machine that allows kids to paint a sign with thick ribbons of wax. Also, they can use magnets to move a thick fluid around and create sculptures. The Projectile Range and Wind Lab lets them launch airplanes as they learn about the mechanics of air pressure. The Light Lab features a wall full of lighted pegs that looks like a giant Battleship game. In the Frozen Shadows display, kids can create a shadow, freeze it and walk away -- and the shadow stays behind. In the Paint with Light area, light-emitting hula hoops and bracelets create colorful designs on the walls as the youngsters move. Recent additions to the Light Lab give kids even more opportunities to have fun while learning how light waves work. The AR Projection Table has a 3D camera overhead, the same kind used in advanced video games. As kids move objects around on the table, a computer projector transmits a colorful display based on the objects’ movements and the distances between them. The Kaleidoscope Towers allow kids to feel like they’re inside a kaleidoscope. Kids can spin the base of the towers, and filters inside the cylinders display colors and patterns on surrounding surfaces. In the activity-oriented Move Studio, Snug Play involves modular pieces that can be moved around as a way of encouraging unstructured play. In addition to inspiring creativity and improving motor skills, the station encourages cooperation since kids often need help moving and placing the large pieces. In the Currents area, visitors learn about the properties of water in motion. Be prepared to get wet. Kids can play drums immersed in water, watch a tank full of water turn into a swirling eddy and be mesmerized by a water wall. For the young environmentally conscious Austinite in the family, the Let’s Grow exhibit features a pretend farmer’s market and chicken coop. Intended for very young kids, the little shoppers can gather plastic eggs and vegetables and learn about good nutrition. The Bloom section of Let’s Grow gives toddlers a garden-themed space for crawling through and playing hide-and-seek. These activities help with sensory awareness and motor skill development. The nearby Story Nook is a place to chill and check out a book. Most of the books are picture books aimed at the very young, but there are also scheduled story times where the little ones who can’t read yet can listen to a well-told tale. In the Faces exhibit, children can take selfies and upload them to a photo wall featuring only that day’s visitors. To make it even more fun, they can alter their own photos, adding mustaches or crazy eyes. A 2,500-square-foot space, the workshop lets kids operate simple machines, paint on a huge glass wall and learn how electrical circuits work. The space also has microscopes, a Stop Animation station, and a Little Learners’ Lab for tiny inventors of the future. Equipped with sinks and counters, the Kitchen Lab hosts supervised activities ranging from baking to creating dramatic fizzing and bubbling. This area offers supervised activities in which kids can learn about chemical reactions, see minerals that humans can eat, and even watch small explosions. The outdoor play area has ropes to climb on and tunnels to wriggle through. Plus, there’s a babbling brook complete with rubber duckies. The museum is consistently a huge hit for the under-5 crowd, with never-ending possibilities for stimulation. However, some say that older kids might get bored after about an hour. It's always a good idea to arrive as early as possible but not for the reasons you might expect. The smiling, helpful staff you find at 9 a.m. sometimes gets a little grumpy and tired by the afternoon. Also, the one-time admission can be a bit steep, but all agree that the membership is a bargain if you plan to visit a few times per year.